Diamanda Dramm received a €5000 grant for the creation of a work by the Turkish composer Onur Türkmen which included travel, collaborative work time and a composition commission fee through the Volsap Foundation from the Eduard van Beinum Stichting. The new work, Songs from a Circle, was part of her concert tour for the Dutch Classical Talent Award in 2018 which she won! A plaque with her name on it has been installed in the hallway of the Kleine Zaal of the Amsterdam Concertgebouw. Volsap was awarded a Performing Arts Fund NL travel grant to support Anne La Berge and David Dramm on their concert and lecture tour to Wellington and Auckland, New Zealand in September and October 2018. They performed two programs in each city. One included works by Sam Pluta, Yannis Kyriakides and Volsap composers David Dramm and Anne La Berge. The other was a set of their duo songs composed in the last thirty-two years where they improvised with local musicians in the second set of the concerts. They also taught private composition lessons, gave lectures on their work and lead presentation/discussions on Splendor Amsterdam. Additional funding was granted for the Fermata Lecture and the Lunch Concert by the University of Auckland and the Victoria New Zealand School of Music for participation in the Aotearoa Festival in addition to lectures and teaching. Volsap was awarded a Performing Arts Fund NL travel grant to support Anne La Berge and David Dramm on their concert and lecture tour to Chicago, Vancouver, Salt Lake City, Santa Cruz and San Francisco. The program includes works by Sam Pluta, Hugo Morales, Yannis Kyriakides and Volsap composers David Dramm and Anne La Berge. The tour started with their Home Movies warm-up concert in Splendor Amsterdam on 12 February and continued with flights and road trips to the US and Canada from 20 February – 12 March. Volsap was awarded a Performing Arts Fund NL travel grant to support Anne La Berge’s tour of her recent solo concert to Morelia and Mexico City, Mexico. Her program included works by US composer Sam Pluta, Mexico/NL composer Hugo Morales and Volsap composers David Dramm and Anne La Berge. She gave a workshop to teenagers on improvisation, graphic scores and electronic music, played with local musicians in two improvisation concerts and performed two composed music concerts. Photos and information about the tour can be found on Anne La Berge’s website. 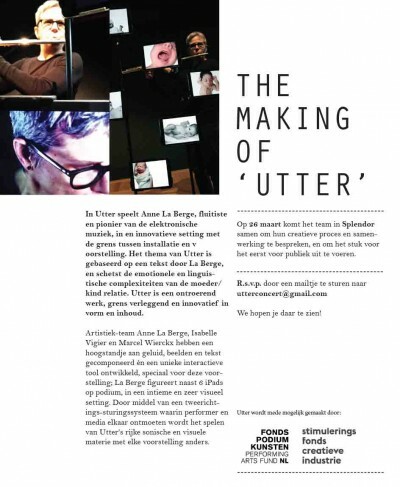 Anne La Berge, Isabelle Vigier and Marcel Wierckx have spent the months of February and March building the performance/installation version of a new work called Utter. Utter tells a story about the complexities of the mother/child relationship from the perspective of language acquisition in a performance with sound and film. The set includes 6 iPads that run a newly developed app that interacts with the laptop that steers both audio and visual material. You can follow the making of Utter and the performance tours here. This Volsap Foundation project is partially funded by the Creative Industries Funds NL and the Performing Arts Fund NL and supported by Splendor Amsterdam.